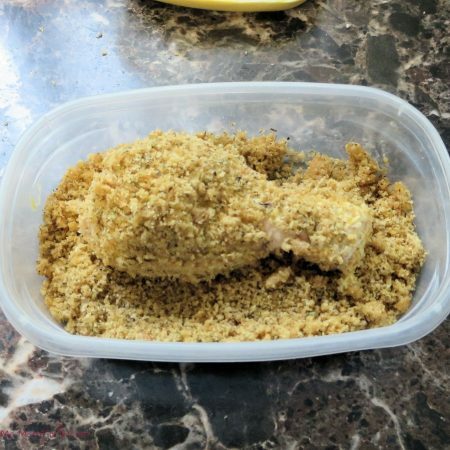 Today, we are making oven baked, fried chicken that tastes just like Crispy Fried Chicken! 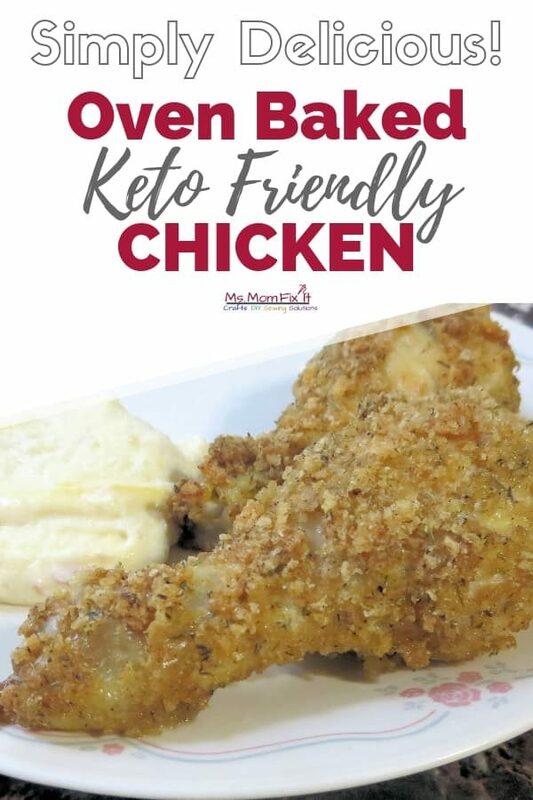 I have tried so many countless fried chicken recipes and breaded baked chicken recipes that I finally had given up hope. I knew I would never master a good chicken recipe. When my family craved fried chicken, we packed in the car and made a trip to the local KFC. We then overloaded with tons of empty calories and not-so-healthy extras like soft drinks and cookies. One day I heard someone mention Keto and started looking more into the nutritional value of the Keto diet. I found several recipes where people used pork rinds to make the crust. I know right! Pork rinds are a snack- not unlike potato chips. How could this be healthy? Well, I’m not going to profess more nutritional knowledge than I have, but what I can tell you is that pork rinds are a zero carb food. Of course, the idea is to become more aware of your carb intake and eliminate unneeded carbohydrates from your diet. Thus, the following recipe was born! 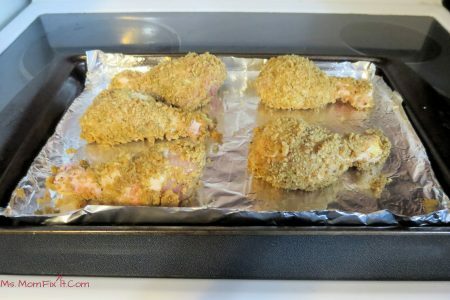 Scrumptiously delicious and perfectly crisp oven baked fried chicken using common ingredients. Use a food processor to grind the pork rinds into a powdery texture. If no food processor is available, you can crush the pork rinds by hand. Add thyme, sea salt, pepper, garlic powder, and oregano to the pork rind mixture. Stir and move to a low height dish or bowl. 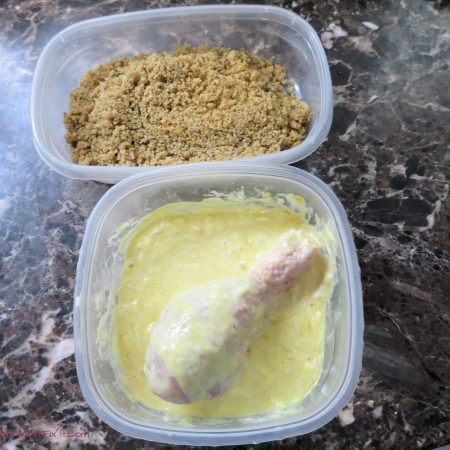 Combine egg, mayo, and Mustard in a separate bowl. Dip each piece of chicken into the egg mixture. Then roll in the pork rind mixture until evenly coated. Place chicken on baking sheet and bake for approximately 40 minutes. Rather than using a standard baking sheet, you will get great results using a copper crisper baking sheet. This is a basket slightly raised off the standard cooking sheet which allows for even heating throughout. This dish pairs great with spinach or Cauliflower Faux-tatoes. Overall, I consider myself a disaster in the kitchen. So, if I can make this chicken taste good, ANY one can make this chicken taste even better! Start by grinding your pork rinds down with a food processor. If you don’t have one available, you can smash them in the bag easily using your hands or a rolling pin. It might be a little chunkier than I prefer though. I like a smooth even coating. Add thyme, sea salt, pepper, garlic powder, and oregano to the pork rind mixture. Stir and move to a low height dish or bowl. You can see how fine my mixture is in the picture below. Dip each piece of chicken into the egg mixture. Then, roll each piece in the pork rind mixture until evenly coated. This recipe has been a total hit with my family and has become a weekly staple! I would love to hear your thoughts on the recipe.